Dinner on the deck of the Coplin Dinner House in Stratton, Maine was delicious. On top of the fresh food, rolling landscape and soft summer breeze, our dog, Lenny, was a welcome guest. He lay under the table, snoozing. That is, until the unmistakable clucking of hens filled the air. Lenny stood up and let out several big dog barks. The couple at the next table, clearly on a date, looked alarmed and held their pastel-coloured cocktails in mid-air. Lenny had never encountered chickens until our road trip. There is something utterly delicious about summer holidays, a time that gives permission to unstructured play. 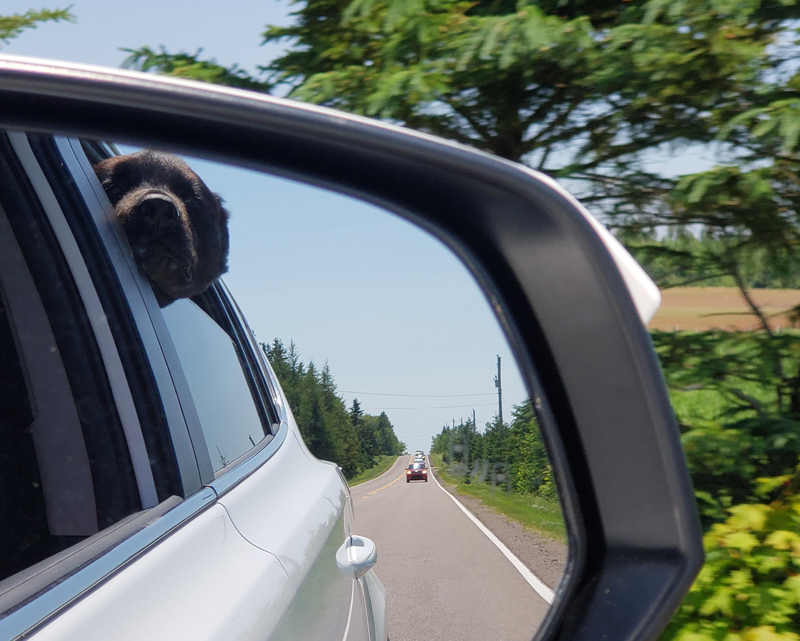 This year, Batia and I drove to Prince Edward Island, Lenny in tow. Our destination was Stanley Bridge, a coastal village in the Cavendish region, where we rented a lovely cottage on the ocean. From the moment we rolled out the driveway, swung by Starbucks and set out for the highway on June 21 ―the summer solstice and the longest day of the year ―our adventure started. The car, our part-time mobile home for the next three weeks, became a place for conversation, debate, reflection and observation. Sometimes, Bruce Springsteen accompanied us; other times, just the sound of tires on the road and the smell of pine trees. Planning our route, we debated whether to travel to PEI through Maine to our first stop—St. Andrews, New Brunswick — or to travel only in Canada. The thought of crossing the border into the United States made us nervous. In the end, we packed our passports on the recommendation of a friend who raved about a dog-friendly motel in Maine. Changing routines allows for a fresh new awareness to unfold. Letting go of schedules, mobile phones and computers to spend time outdoors is good for the soul, opening us to the magic of changing seasons and shifting weather patterns. While travelling with a dog requires more planning —where to stay, what outdoor cafes allow dogs, which beaches are canine friendly —taking a holiday with the family pooch creates new adventures. Enroute to PEI, we drove through Quebec, Maine and New Brunswick. In St. Andrews, New Brunswick, we stayed at the Algonquin Resort, a destination Lenny adored. Evenings, he would lie on the grass, his water bowl within nose reach. No amount of tugging on his leash could budge his 80-pound frame, stretched out, tail fanning the air, waiting for the next family to greet him. Lenny was like a magnet for tourists from across Canada, the US and Europe. Frequently, they would wander over and say, “I miss my dog. May I say hello to yours?” Yes, even the dog was on vacation. There is something grounding about a road trip, a time to appreciate the changing landscape from the car window, chat with the locals and sample fresh regional cuisine. Crossing the Confederation Bridge, we marvelled at the engineering of the 12.9 kilometer structure transporting us to Prince Edward Island. Once the car tires hit the red soil of the little island, we were greeted by lush fields filled with lupines and potato plants. And, of course, there was the omnipresent ocean, one moment sparkling and still, another moment dark and turbulent. Settling into our cottage, we felt the spirit of Anne of Green Gables everywhere, so much so that I bought a copy of the children’s classic by Lucy Maud Montgomery which I first read at age eight. Anne fever was also shared by the young Japanese women we met who had been introduced to the red-haired girl in their country and were now on a pilgrimage to explore her stomping grounds. In addition to billboards for all things Anne, we saw numerous highway signs warning of moose and signs reminding motorists to share the road with horse-drawn buggies. I had no idea that Amish families had moved to the island from Ontario at the invitation of the PEI government to help stimulate growth in rural communities. And here’s a fun fact: to this day, I have never seen a moose, but I have now seen a horse-drawn carriage transporting two Amish farmers back home at the end of the work day. Our summer road trip is now officially over. We swam in the ocean, sampled lobster rolls, clam chowder and fresh haddock, clocked a whopping 4,500 kilometers, and gathered a lifetime of memories. Once home, Lenny anticipated that the three of us would continue to do everything together. So, starting this weekend, we have decided to add more play to our lives by exploring the little towns and villages in the Ottawa Valley. And Lenny will be right there with us, head out the car window, black fur blowing in the wind.